Deigned by Susanne Bennett and Mark DeKay, this learning game helps student and professional design teams to build design strategy bundles using Sun, Wind & Light strategies. The purpose of the Bundle-Up! game is to make learning climatic design strategies and their complex interrelationships fun and easy. 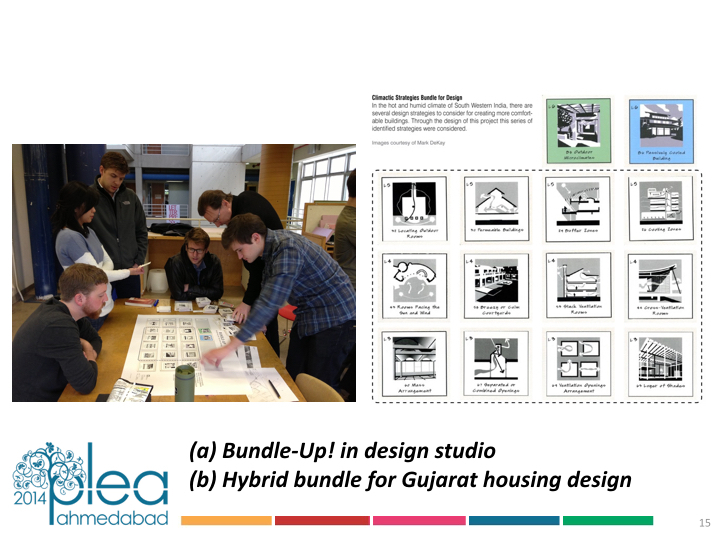 The project uses the concept of Bundles developed in the research project, “A New Knowledge Structure for Net-Zero Design.” The idea of design strategy bundles is to resolve conflicts and tensions among strategies by proposing related sets of design strategies that address recurring problems designers face. A Bundle identifies several discreet design ideas that apply in a particular situation across three scales. The game outlines a set of rules for users to create their own bundles specific to a particular project. Bundle-Up! is used with a set of instructions like a typical board game. It is designed to use design strategies from the book Sun, Wind & Light, 3rd edition. There is no one right solution, but some answers are better than others, and solutions that follow the rules are all acceptable. Bundle-Up! can be played by one person or several in collaboration. The game pieces (more than 100) each represent a climatic design strategy, each with a unique graphic and other identifying features and descriptions. A prototype was tested with peer teachers and feedback was very positive. The Bundle-Up! game has since been tested in fifth-year B. Arch design studios and with second-year technology course students. Feedback has helped refine the game and its instructions, along with the curricular exercises that accompany it. Download the files for making your own game below. Print the 24" x 36" game board on a large format printer. Print the cards (playing pieces) on sticky-back adhesive paper. Cut them out and adhere to cardboard. We use blank beer coasters. Have fun!